This is a simple recipe one that I modified for myself. It is suitable for almost all diets except those of you that are celiac. I have not tested this with a flour suitable for a celiac diet. if you do experiment though I would love to hear your results. Update: I have since halved the amount of sugar in this recipe and the bread is that much better. the original recipe i modified called for 2/3 cups of sugar this left the bread more dense than I wanted. it was still good just not as springy as I was hoping for also update the photo to be the proper subject as the one i first used was made with white flour not Whole Wheat. Punch dough down. Knead for a few minutes, and divide in half. 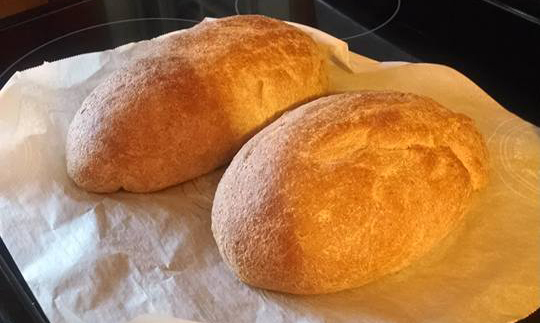 Shape into loaves, and place into two well oiled 9×5 inch loaf pans. Allow to rise for 30 minutes, or until dough has risen 1 inch above pans. You can also just throw them on the oven stone without the pans if you have one in your oven this is what I do.